Today the USA women’s national team kicks off the 2011 Women’s World Cup and I thought it’d be appropriate to contemplate where we are with the women’s game. First some background about my involvement in the women’s game. In October of 2000 I started my career towards coaching. I was asked to be a volunteer assistant for our women’s basketball team, and it was an eye opener for me. I was a bench warmer for the men’s team, but every day I would finish practice and stick around for another two hours with our women and I could see I had a lot to learn. Our men’s team was pretty good (we had made a run at our national tournament the year before) and our women’s team was on the opposite end of the spectrum. The psychology, the tactics, the communication, and the pace were all things that I had to change and adapt to. My first position as a soccer coach was a student assistant for an NCAA D2 women’s team that was fighting to get back to the top of the conference. I have to be honest that I had never really spent that much time around women’s soccer. The college I played at didn’t have women’s soccer (doesn’t have men’s soccer any more either, for that matter), and I had never really paid much attention to the new WUSA league. I have to be honest, when I took that first job as a coach with the women’s basketball team I had a naive opinion of women’s sports. And all I wanted to do was get some experience under my belt so I could move on to coach men’s sports. As I developed myself as a coach in the world of women’s athletics for the next five years a lot changed about my presuppositions. I ended up coaching women’s collegiate soccer for six years total, and it was a great experience that I look back on fondly. With every male athlete I’ve had that wants to go into coaching I’ve made sure to mention to them that coaching women’s teams for eight years was pivotal to my development as a coach. It made me a better teacher instead of simply a motivator (which is what most of my coaches were). Now we sit at a very crucial time in women’s soccer for our country. Most every sports reporter agrees that the USA has an up hill battle at the 2011 World Cup, and countries have really caught up to our level of play. In fact, the USA is said to have fallen behind because we don’t have the creativity that other nations are fostering. Of all years to win a championship, this has to be the year. Our professional league seems to be on the brink of falling apart again. The development of girls soccer is starting to take steps forward, but we need a boost of confidence in what the new director is doing and trying to promote. The new girls Elite Clubs National League is trying to get off the ground and replicate what the boys USSF Developmental Academy system is doing. Could there be a better time to have our women come home with a Cup win? It would help fuel the fire to take the next step in the women’s game for our country. What happens if we don’t win? I think our professional league continues to struggle with getting a foothold in the fan base and team continue to close and open for one year at time until the league folds in a couple of years. The ECNL will grow and become the developmental arm of girls soccer, but it will take more time and girls will choose to stay closer to home instead of playing on these demanding teams. Is it unfair to put so much on our national team? There was so much talk about how important the 2010 World Cup was going to be for the USMNT and the popularity of soccer in general for the USA, and I think there was a lot of truth to that. With success at these international competitions the USSF has been able to raise the national awareness to soccer. But the women’s national team has a lot more responsibility to the women’s game in the country than the men’s team does. The only game of women’s soccer that I’ve been able to catch on a major network on basic cable will be the 2011 Women’s World Cup matches. Men’s soccer has had matches from the EPL, La Liga, Serie A, MLS, and international competitions like the Gold Cup, Confederations Cup, and the World Cup broadcast (at 6 am, but they’re on at least). This is the one chance that the women’s game gets to show case the quality that they can bring to the game. Is it unfair, probably, but it’s reality. If we want attendance at WPS games to increase than soccer fans in this country need to see a product on TV that will attract them to get in their car and drive to a game. If we want our young girls to aspire to join the US Women’s National Team they need to see the USA lifting trophies on international television and being praised as heroes of the game! Then our youth will want to travel and play the best competition to be developed and selected for the youth national teams. Will women’s soccer die in the USA if we lose, no. It will continue, like it has for the last three decades, to grow steadily and with ups and downs. But it would be great to see the women’s game get the recognition and opportunities that they deserve after the struggles they’ve been through to play this beautiful game. A few months ago I wrote about helping my club, and college, players fall in love with the game of soccer. One thing I noticed living overseas that we lack here in the USA is national pride in our national sports teams. Growing up in a different country y0u learn quickly how important national pride is, and sporting events give a country something to rally around. I think one of the biggest challenges in the USA is how large we are geographically as a country. We feel disconnected and distanced from each other as states. We have major pride in our local teams, no doubt about that. When I relocated from California to Nebraska I had never seen an entire state identify themselves with one college team, but the University of Nebraska is THE football team in the state. I wonder sometimes if our national pride is diminished because we are such a large country with some many sports teams (college and professional) that we only recognize international competitions when one of athletes from “our team” makes the national squad. I wanted to expose some of my club and college athletes to this national team pride. 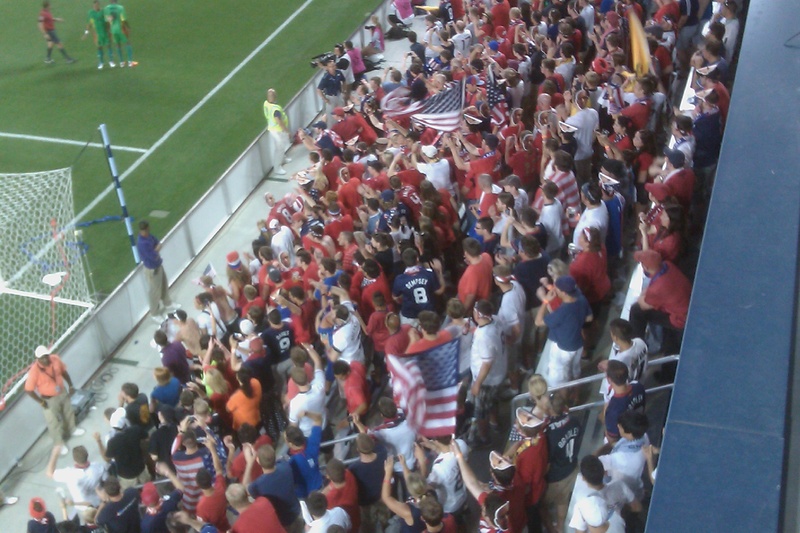 When the Gold Cup venues and schedule were announced I jumped on the opportunity to take a group down to Kansas City, KS for the USA v. Guadeloupe game June 14th. I thought I would be lucky to get 20 guys to go down with me. Instead I had a huge response from not only the players, but their families as well! We are taking a group of 48 players and families down to the USA game from South Dakota! I really believe, given the oppotunity, that families involved with the sport of soccer would become huge fans if someone would help them connect with some of these events. If a small soccer club with barely 100 members in a small town in South Dakota can generate enough interest for 48 people to attend an event, what could happen at some of these other associations? I think the key is exposing players and parents to the highest level of soccer available in your area, and make an event out of it! I know the clubs in Dallas did this a lot by having a club night at an FC Dallas game, or a college game like TCU and SMU. If the highest level in your area is high school soccer, get all the U10-U14 players to a game. Take the U14-U19 kids to a college game in the state that offers a high level of soccer so they have something to aspire to. And if you’re fortunate enough to have a USL, NASL, or MLS team in the state I believe we should make a big deal of attending a game and being a fan of that team. Pumped for the USA game! Pumped to see the first team in action this week!